Small and medium-sized business (SMB) is a basis for economic development, employment and creation of new jobs and the key source of budget revenues in any country. The relevant regulatory and legal framework builds on the term “small and medium-sized enterprise”. Small and medium-sized enterprises include businesses with up to 250 employees, up to EUR 50 million of annual income as well as sole traders. In the Ukrainian context, the terms “small and medium-sized business” and “small and medium-sized enterprise” share the same acronym — SME. This makes the two terms equal and fails to demonstrate the important role played by sole traders (ST) in small and medium-sized business. In this study, SME will be used as abbreviation for small and medium-sized enterprises, and SMB — as abbreviation for the whole sector of small and medium-sized business (legal entities and sole traders). SMB’s share in Ukraine’s economy is as large as 99%. SMB employs 79.1% of Ukraine’s total workforce. Therefore, public authorities should elaborate social and labour policies primarily with due consideration of the opinion of representatives of small and medium-sized business. 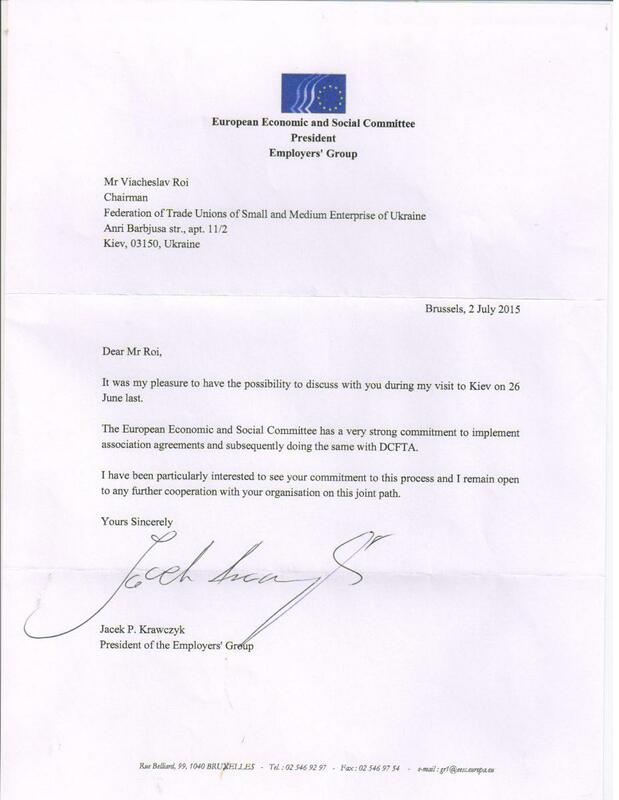 - Poor representation of SMB in the decision-making process in social and labour sector. Taking account of these peculiarities for the purposes of reforming and regulating the social and labour sector will facilitate better communication between the business and public authorities, improve the quality of managerial decisions, increase employment rates and develop the SMB in the country. Efficiency of the SMB policy depends on whether or not public authorities and the business have a common vision of the future in this sector. That is why the policy-making process should build on transparent and continuous cooperation between public authorities and representatives of the SMB. November 2014, institutional setup envisaged by the Association Agreement has been launched. 470 of the Association Agreement. Assembly of the Ukrainian side of the Civil Society Platform (CSP) was formed. held in President Hotel (Kyiv), has finalized preparatory work. which should be considered by official bodies of Ukraine and the EU. participated in the Constituent Assembly directly. the priorities of the constituent process. In Kyiv it have been organized a meeting of regional representative EFFAT Mary Kurzina with Deputy Chairman of the All-Ukrainian Trade Union of Workers of the tourism, sanatorium and hotel industry Svetlana Vnuchko. Also this meeting attended the chairman Ukrainian Alliance of Trade Unions , Chairman Federation of Trade Unions of workers in small and medium enterprises of Ukraine Viacheslav Roi. During the meeting they discussed real situation of the trade union movement in Ukraine, Ukrainian trade union cooperation with tourism EFFAT, prospects of integration into EFFAT. During this discussion, Viacheslav Roi told the history of development ( over 24 years) of the Federation of Trade Unions of Small and Medium Enterprises of Ukraine, history of Ukrainian Alliance of Trade Unions. 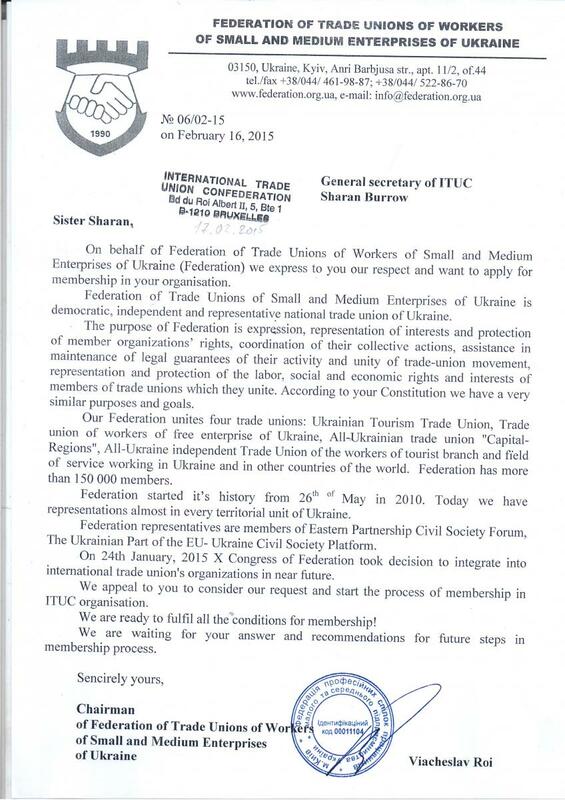 Also he noticed that today Ukraine face the reformatting of the trade union movement. He voiced the problems of collective bargaining in small businesses , the need to prepare professional organizers, social issue in investment projects, importance of international cooperation. Svetlana Vnuchko focused attention on paydays in "envelopes", seasonal work, inability to dialogue with the international tourism industry nets, reducing the number of employees in connection with the occupation of the Crimea, the inability to defend the interests of more than 5 thousand salaried employee - union members - facing redundancy due to the transition of the Crimea under Russian jurisdiction, disrupt the tourist season in the resort regions. M. Kurzina told about the history and development of EFFAT and IUF, the specifics of the trade unions of the tourism industry affiliates to EFFAT. Following the meeting, participants agreed on the need for a round table in Lviv (Ukraine) and the need to participate in EFFAT Tourism Sector General Assembly on 25 April 2014 in Brussels as observers for ukrainian trade union representatives. Recently implemented reforms in Ukraine looked promising. Signing the agreement with EU was to set Ukraine’s position for reforms. Thus, it would become a signal for investors and international institutions worldwide, that Ukraine takes its modernization seriously and country becomes predictable and reliable partner. European integration is not a short-term solution for our country. It's a path where Ukraine has to apply modern European social standards (decent job conditions and salaries, education, retirement provision, work security), reach the economics competitiveness level, rule of law, and, as result, better quality of life of all its citizens. © 2010 Federation of trade unions of workers of small and average enterprise of Ukraine. All rights reserved. Site development. TOTEM Company.